GENEVA (IDN) - Ahead of the 2015 Review Conference of the Parties to the Treaty on the Non-Proliferation of Nuclear Weapons (NPT) scheduled for April 27 to May 22, 2015 in New York, the Community of Latin American and Caribbean States (CELAC) has expressed a clear vision for the future of nuclear disarmament. 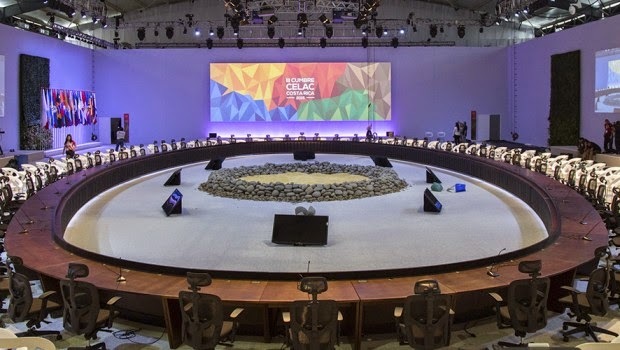 The 33-member CELAC formally endorsed at its third annual summit in San José on January 28-29 the ‘Austrian Pledge’ delivered at the close of the Third International Conference on the Humanitarian Impact of Nuclear Weapons (HINW) last December in Vienna. The Austrian Pledge, delivered by Secretary-General of Austria’s Foreign Ministry Michael Linhart on December 9, 2014 explained that the facts and findings of the Vienna Conference – as well as previous HINW conferences held in Oslo, Norway, on March 4-5, 2013 and Nayarit, Mexico, on February 13-14, 2014 – had shown that more diplomatic action was needed. The Austrian Pledge recognised the existence of a “legal gap” in the international framework regulating nuclear weapons and called on all states to join in efforts to fill this legal gap by pursuing measures, which would stigmatise, prohibit and lead to the elimination of nuclear weapons. According to the Ploughshares Fund, Russia, United States, France, China, Britain (five permanent members of the UN Security Council) and Pakistan, India, Israel and North Korea possess a total of 16,300 nuclear weapons. “Of these, around 4,100 warheads are considered operational, of which about 1,800 US and Russian warheads are on high alert, ready for use on short notice,” says the Federation of American Scientists. “The Austrian Pledge is a rallying call for states to demand action to fill an unacceptable legal gap. The momentum generated by the humanitarian initiative is paving the way for the commencement of a process to ban nuclear weapons. CELAC states have added their voices to the call. We expect other regions to do the same,” says Daniel Högsta of ICAN. There are indications of growing support for banning the bomb in Britain too. ICAN UK and the All Party Group on Weapons and the Protection of Civilians discussed in a parliamentary briefing on January 21 the implications for the UK’s own nuclear weapons. The meeting came just a day after a parliamentary debate on the renewal of Trident. During the debate, called by the Scottish National Party, Plaid Cymru and the Green Party, many members of parliament (MPs) pointed to the catastrophic risk of nuclear weapons due to intentional and accidental detonation. The Labour Party’s Katy Clarke noted that the abandonment of Trident would not only be a significant symbolic step towards nuclear disarmament, but would also have a significant impact internationally. Another Labour Party MP Paul Flynn pointed out that the continued possession of nuclear weapons by certain states also tacitly encourages other states to maintain and develop their own, thereby actively thwarting disarmament efforts. Other speakers during the debate also noted that, as a permanent member of the UN Security Council, the UK has an obligation to pursue nuclear disarmament in good faith, and this obligation should be met by a nuclear weapons ban. “It is high time the Government stated their support for a new legal instrument prohibiting nuclear weapons that would complement our disarmament commitment under Article 6 of the non-proliferation treaty”, said Scottish National Party MP Angus Robertson. Many at the meeting agreed that now – after the Vienna Conference and before the NPT Review at the UN headquarters in New York – is the time to push through the agenda. Article VI of the 1970 NPT obliges all Parties to the Treaty to undertake "to pursue negotiations in good faith on effective measures relating to cessation of the nuclear arms race at an early date and to nuclear disarmament, and on a Treaty on general and complete disarmament under strict and effective international control". This is the world’s only legally binding obligation on Nuclear Weapons States to reduce and ultimately eliminate their nuclear weapons. At the 2000 NPT Review Conference, State Parties to the Treaty agreed on " 13 practical steps" to meet their disarmament commitments.